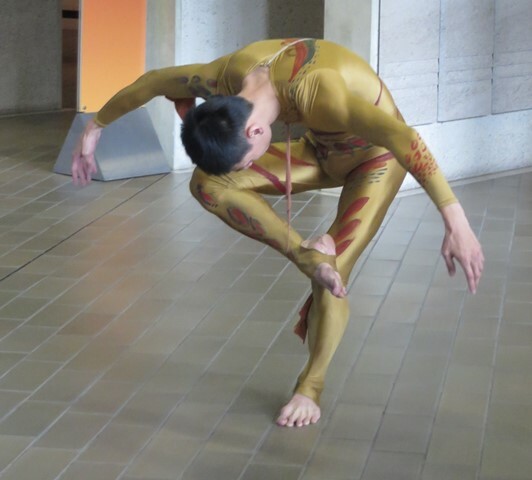 My review of Fortuity from Mirramu Dance Company with guest artists from Taiwan is now available on DanceTabs at this link. Elizabeth Dalman and her guests also appeared on several occasions during May in various public places and institutions around Canberra. I was able to see two such performances, one in the National Gallery of Australia and one in the Canberra Museum and Gallery. The National Gallery of Australia show began in the foyer with a solo by Chen Fu-rong from Dalman’s work Landscape, made originally in 1967 for Australia Dance Theatre to music by Nomad and Clifford Brown. Chen’s solo was Dalman’s response to works in the Mandala series by South Australian artist Lawrence Daws and was memorable for Chen’s strong sense of balance and his capacity to extend his limbs into the off-centre poses that characterised Dalman’s choreography during the 1960s. A second highlight of the program, which also included improvisations in response to various works as we moved from the foyer to the downstairs sculpture gallery, was another solo, this time from Peng Hsiao-yin entitled Woman of the River. This piece was made by Dalman for herself in 1987 to music of the Penguin Café Orchestra and was recently handed on to Peng by Dalman. Peng’s performance was filled with lyricism as she danced Dalman’s flowing, swirling choreography, weaving her way around the varied sculptural items currently on display. The showing at the Canberra Museum and Gallery was largely characterised by improvisations but concluded with solo danced by Vivienne Rogis, which was mesmerising for the calmness Rogis was able to bring to the piece.